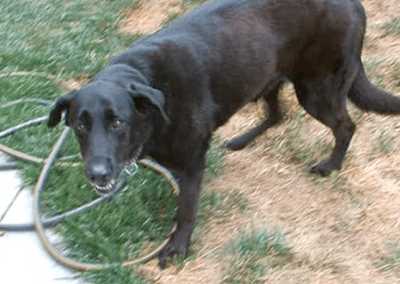 When we got our lab-mix Bailey nearly 11 years ago, we were living near the Snohomish river in Monroe Washington. Being that she was part Labrador Retriever, I was looking forward to taking her to the river on occasion to run along the shore splashing like dogs do. Well, we found out that she HATED the water. In fact, she would not go much past her elbows and only if she was tip-towing so not to get her underside wet. What a sissy-girl-dog. That was then. This Monday, after not eating for over a week, the x-rays came back with indications of a baseball sized tumor on her spleen. She lost 10 pounds in that time and we know she was not long for this world. So I took her home from the vet so we could all say goodbye to her. The morning was long and few words were spoken. Everybody gave silent hugs. The photo above is the last picture taken of her after my wife took the kids to school. Bailey and I got in the truck and went for a long one-mile ride. We parked in front of the vets office, and I decided to take her for one last walk. There is a river behind the vets office, so we wandered over to the path that runs along the top. Bailey found more energy than I had seen in her for weeks when she saw the river and the birds flying around. She started to go down to the water and I figured that she was just thirsty. Then when she reached the shore, *SPLASH* she had jumped in… full-body! I was laughing-out-loud and said “You stupid dog, you HATE the water!” She looked back at me and kept going forward into deeper water. Since she was very sick, she had very little balance and kept falling over in the water, so I coaxed her into coming back to dry land before I had to go in and get her out. She came to me and shook off. We then walked down the path a bit further watching the birds. I know that she was really tired from her excursion into the water when she only looked at the Heron that was standing on the fence next to the river. She leaned heavily on my leg as we walked and I knew it was time. It was a really nice walk.